Recording session resumes in this holiday season. We have been working with Believers, the man’s singing group of Shatin Baptist Church for couple of months, and the released day will be on March 2005. The recording schedule will become more packed as the deadline approaches. We’ll try our best to make another high quality album within tight schedule and budget. At 23:10, I receive a phonecall. Ivor of Frontline tells me that my boss / producer / Frontline’s vocal coach and producer, Steven Ip, is on air at Metro Finance FM104. And the song on air is Frontine’s “Emmanuel”. I’m very excited, however, we don’t have radio in studio. 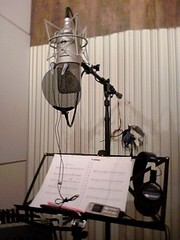 And most importantly, we’re having recording session in the meantime. Steven is in the recording booth, and at the same time, on air? !